The War Against Humaneness. – Disorderly Conduct. Dixon, Illinois is an pretty historic place. It’s where Illinois’ most famous resident, Abraham Lincoln, decided to join the Blackhawk War. 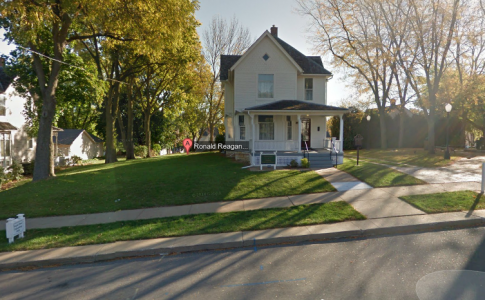 It was also the boyhood home to another man, Ronald Reagan, who went on to become president. To criminal defense attorneys and the loved ones of their clients, it’s also home to other people: prisoners at the Dixon Correctional Center. Two weeks ago I found myself driving by the Lincoln and Reagan historical markers towards the dilapidated, run-down, and generally monotone prison. The place is pretty depressing, but I had the privilege of meeting a client there. And, I didn’t put “privilege” in quotes for a reason. I’m not being sarcastic (for once). Every person with an opinion- one way or another- on mandatory minimums, how our justice system works, and what should happen in prison should have the opportunity to visit prisoners. It’s not as though I would expect it would change your mind either way. It adds legitimacy to your opinions, though. I’ve been there many times before. As always, the procedure to go through security was different than the last time I was there. When I finally got through, I took a seat at my assigned table and waited for my client. And waited. And waited. I waited in that large visiting room for an hour. I’m still not sure what took so long, but that’s life in the prison. About 45 minutes, after looking around at people playing cards, chatting with prisoners, and sharing snacks I became somewhat proud of these other visitors. It’s easy to ignore somebody in your life who did something terrible. Letting some guy in a far off prison pay his debt to society by his lonesome on a random Friday is an easy decision to make. By golly, he deserves whatever he got, right? Out of sight, out of mind! Taking a personal day from work, putting gas in the car using your own money, and risking driving to visit somebody in a jail or prison that you might not even get to see because the facility is suddenly on lock-down isn’t such and easy thing to do. Yet, lots of people do it. I didn’t know anything about any of these other visitors. I just knew they didn’t make the easy decision that day. The reality is that most people in jail or prison are there for a relatively short time. Most are going to get out before too long. Most of the people in county jails haven’t even faced their charges yet- meaning they’re even presumed innocent. The majority of inmates in the prisons are probably released within a year or two. A sentence is rarely a life sentence. They’re humans. Like it or not. Some are good humans with bad drug problems. Some are ok humans who made bad mistakes. Some are even bad humans. You don’t have to visit them, but you shouldn’t go out of your way to prevent others from doing so. Part of being human is interacting with other humans. Nobody gets “institutionalized” faster than a person who only interacts with people in the institution. In the long run, when those prisoners are released, we’ll all be better off if they know they have some sort of their own support system in the outside world. As if it wasn’t already difficult enough to visit an inmate at the Cook County Jail, Sheriff Tom Dart has now instituted new rules requiring that each potential visitor complete a “Visitor Application” form and they ask that you wait for at least three days before calling to see if you have been approved. I won’t go through all the bogus reasons they are going to use to lighten their visitor load (you really should read Wallin’s post). However, those reasons vary from the nefarious “the visitor was released from any county jails within the last 60 days” (meaning somebody who went to trial on an unrelated matter, was found not guilty and was released from jail can’t go see their mother in CCDOC), to the vague and impossible to challenge “any safety or security reason” as determined by jail officials. I don’t really know what reasons the Sheriff has for the new policy. I don’t really care. I know that making it hard for families (and even attorneys) of the incarcerated is a bad long-term policy. It’s not very humane. Previous Previous post: “We dropped $200k on this armored truck and there hasn’t been a murder since,” said no police department, ever.